On-loan defender George Cox admits League Two is a world away from playing for Brighton U21s after he was handed his first taste of senior football on Saturday. 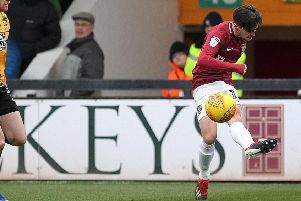 Given he had yet to play a single league match, the 21-year-old coped admirably on his Cobblers debut against Carlisle United, producing a solid performance at left wing-back before being replaced by David Buchanan on 75 minutes. There were a few butterflies before the game but as soon as you get out onto the pitch you forget about it and the lads helped get me through the game. He may take a few more games to adapt to the more competitive, physical nature of League Two football though, especially considering he has featured so little at any level this season, playing just two games for Brighton U21s. “It’s a bit different to what I’m used to and how the ball comes out to my position but I’m happy to have got involved and play a part in our forward attacks, but there’s room for improvement,” he said after Saturday’s 3-0 victory. Cox admitted to having a few nerves ahead of kick-off on Saturday, and he also knew he would struggle to last the full 90 minutes with his match fitness still not up to full speed, hence his withdrawal for Buchanan. “I think the substition was a bit of both, tactically and physically,” added the Brighton man. “I hadn’t played a football match in a month so I was feeling tired and to be honest I wasn’t too annoyed to see my number go up! “There were a few butterflies before the game but as soon as you get out onto the pitch you forget about it and the lads helped get me through the game.